Gutter Masters LLC is a local family owned company that originated in 1987 same owner, same location. We have installed gutters on over 15,000 properties! We work hard one job at a time for your neighborhood references, our NARI membership and our outstanding BBB track record. We also maintain for your protection General Liability Insurance, and are listed with Dunn and Bradstreet. At Gutter Masters LLC we stand behind our work and look forward to standing behind the job we do for you. SERVING THE DFW METROPLEX. 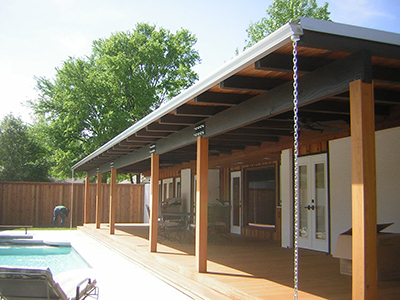 Our gutters 5 INCH standard, or 6 INCH – the preferred for HARD TEXAS STORMS; are manufactured SEAMLESS at your home from .027 thick stock that comes PREFINISHED with 35 different BAKED ENAMEL paint colors; which are warranted against peeling, flaking, and corrosion for 50 years. If your rain gutters are worn down, sagging and inefficient, then it is time to replace your gutters. If you are in a position where you need to have your old gutters removed and new ones installed, turn to our team. Copper is unbelievably durable, making it a solid selection for parts of the home subject to extreme wear and tear, such as rain gutters. For some, they’re more desirable than their aluminum counterparts, because copper gutters last longer and provide you with better rainwater removal. Dear Mr. Tropoloc, You recently carried out the complete replacement of the guttering on my house in the Lakewood area of Dallas. I am writing to express how pleased I have been with every aspect of the service your company provided. From the promptness and thorough initial quote, through assistance with finding contractors for the preparation work, to the completed job, your company's competitive pricing, technical performance, attention to detail and courtesy have all been exemplary. I have no hesitation recommending Gutter Masters whole heartily to any prospective customer. Harry, I wanted to thank you for such a great job on installing new gutters for me. I can tell that the new gutters are much better than the old ones. The color of the gutters matches the paint even better than I thought it would. You really do great quality work. Thanks again. Dear Harry, You told me you were not a "miracle worker" when I told you I had a problem and needed a problem solver! Thanks for doing the gutter extensions; that solved the problem! They look nice and I appreciate your coming by and doing them while I was in the hospital. I love my gutters! The difference having quality gutters around your home is amazing. Harry did an awesome job, such quality work. He was able to go out to Rowelett when I asked him about another job. I found Gutter Masters to be reliable, flexible and meticulous. Would definitely recommend him. Our EMPLOYEES – not SUBCONTRACTORS- have been trained and tested to install to our exacting standards. Ask our competitors if THEIR WORKERS are PAID BY THE PIECE – and expect them to take SHORTCUTS on your home. We EMPLOY by the HOUR and eliminate the shortcut incentives. The owner, Harry Tropoloc, personally installs and supervises every job. ALL GUTTERING SYSTEMS ARE NOT THE SAME, THE DIFFERENCE IS DETAILS – AND OUR QUALITY IS YOUR VALUE. 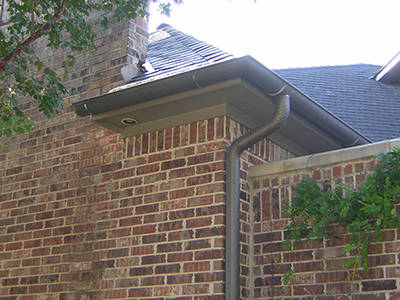 Our gutters 5 INCH standard, or 6 INCH – the preferred for HARD TEXAS STORMS; are manufactured SEAMLESS at your home, with 35 different BAKED ENAMEL paint colors; which are warranted against peeling. Each of our rain gutter installation’s begins with a thorough inspection of eaves, fascia boards, and soffit boards so there are no surprises during the install process. The work begins with a complete rain gutter inspection. During that process, we will check for leaks, faulty installation, and look for loose seams. Next, we will assess the total drainage of your system to see what additional areas need attention and can be improved. Finally, we will repair and replace any and all sections of the gutter system that are not performing as designed. We may add or change draining zone for maximum efficiency. 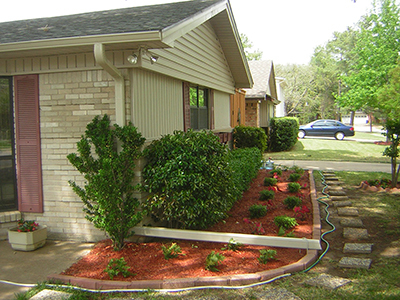 Gutter systems work effectively when all the gutters are clean and free of debris. Regular maintenance keeps drainage where it should be and keeps unnecessary water accumulation off your lawn. We will clear and remove all leaves, check and clean all downspouts and ensure there are no clogs. Finally, we will test all draining zone for proper drainage. Family Owned and Operated We have a long history of satifying our customers! Why you need Rain Gutters? Copyright © 2018, Site Designed by DFW Website Designers. Serving: Addison, Allen, Arlington, Carrollton, Cedar Hill, Colleyville, Coppell, Corinth, Dallas, DeSoto, Duncanville, Farmers Branch, Fort Worth, Frisco, Grapevine, HEB, Highland Village, Irving, Lewisville, Mansfield, McKinney, Mesquite, Park Cities, Richardson, Rockwall, Rowlett, Southlake, The Colony, Trophy Club, University Park, Westlake, Wylie.